Bee Healthy Tip – Flu Season is Here. Are you ready? The flu can hit seniors like a Mack Truck! That’s because their immune systems weaken with age. If you’re over 65—or care for someone who is—keep the following in mind as we head into the flu season. As for the rest of you? We have a message or two for you, as well. A better match. Last year, seniors really bore the brunt of the flu season. Sixty percent of flu-related hospitalizations and nearly 80 percent of deaths were among those 65 or older. One problem was that last year’s main strain of flu (H3N2) wasn’t included in the vaccine. So the vaccine was only 13 percent effective against it. This year’s flu vaccine should be a better match for circulating strains of flu, according to U.S. officials. There’s also an adequate supply of vaccine. Long-term protection. More good news? A recent study has found that flu vaccines offer moderate protection for about six months. That’s the length of most flu seasons. The study’s findings suggest that a flu shot in early fall may prevent the greatest number of cases. The common good. The CDC recommends that everyone 6 months and older be vaccinated each year, but only about half of all Americans do. Even if you’re young and healthy, getting a flu shot is important. And it may be one of the nicest things you do for your neighbors—especially those older than 65 or younger than 2, pregnant women, or those with chronic health problems or weak immune systems. By protecting yourself, you also help protect others. A recent study showed that higher vaccination rates among young and middle-aged adults may lower the risk of flu among older people. Talk to your doctor or us about your best option. Seniors are at greater risk for pneumonia—a complication of the flu. So find out whether you also need the pneumococcal vaccine. Take antiviral drugs such as Tamiflu or Relenza, if prescribed. These drugs attack the flu virus and stop it from growing. 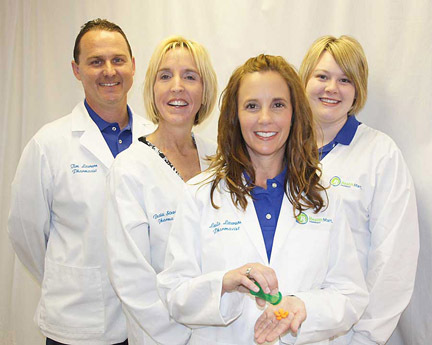 The Pharmacy Team at Metropolis Drugs II is here for you. If you do catch the flu this season stop in for your flu needs and talk with our pharmacists about your symptoms. We are here to help. This entry was posted in All the Buzz - Bee Informed, Bee Healthy on October 14, 2015 by massacbeeswax.